May 1, 2018 – Be careful, don’t ever judge a book by its cover. Louisville Slugger didn’t and embraced these unique baseball players and team concept. Take it from LS Warriors National Amputee Baseball Team player, Daniel Williams, who is missing his left hand, “I am very excited to be a part of this team! I hope we can be a source of inspiration to others who are dealing with challenges in their lives and show them that you really can do anything you set your mind to, even without being “normal”. 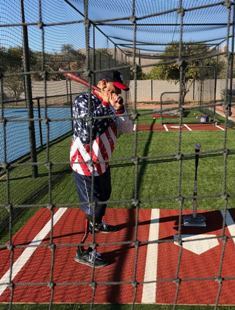 Daniel is one of 15 players on the LS Warriors, a team that consists of U.S. Military Veterans, Active Duty personnel, Wounded Warriors and current and former college baseball players. All of these highly skilled athletes come from all walks of life. They have either suffered a loss of limb, partial limb, digits, eye, and serious limb deformities, plus other prostheses all due to congenital, disease, or trauma-related reasons. After a competitive selection process and national tryout in January 2018 at the Ballpark of the Palm Beaches in West Palm Beach, Florida (Spring Training home of the Washington Nationals), the team is practicing and preparing for their first Men’s Senior Baseball League (MSBL) / Men’s Amateur Baseball League (MABL) tournament. As U.S. Army veteran and wounded warrior, Carlo Adame explains it, “This team means a lot more to me than just playing baseball. I get a chance to play baseball at an elevated level alongside brothers that have fought a lot of the same physical and mental battles as I have. Steve Sigler, Founder and President of the MSBL/MABL, the largest and premier amateur baseball league for adults 18 years of age and older, contacted LS Warriors General Manager David Van Sleet, about fielding an amputee baseball team to play in the 30th annual MSBL World Series which took place in the Phoenix, AZ Metropolitan Area in October 2017. For the first time ever in history, an all amputee baseball team played in the MSBL/MABL World Series. The tournament resulted in such a positive success for the team that a number of the players inquired about forming a national, amputee baseball team that play all year round against competitive, able-bodied teams in national tournaments all over the country. MSBL/MABL was founded in 1988, and is the fastest-growing adult baseball organization in the country. The league has 325 local affiliates, 3,200 teams and 55,000 members who play organized amateur baseball in local leagues, 30 regional tournaments and six national tournaments. Both the MSBL and the MABL plan to expand by establishing local affiliates in communities where programs do not exist, and also by welcoming existing amateur hardball leagues to affiliate. The MSBL is poised to reach 50,000 members in the very near future. Upon hearing of the LS Warriors, MLB Washington Nationals quickly expressed a commitment to support the team. In gratitude of their commitment, the LS Warriors will be wearing the Nationals official game hat during all of their practice sessions and tournament games. Bringing their vast baseball experience, volunteering their time and carrying their passion for the game of baseball forward, former MLB players Curtis Pride, Kevin Mench, and John Kruk have all agreed to be on the team’s coaching staff. So remember, before you judge a book by its cover, look much closer!